Leading Manufacturer of upvc pipes 1/2" sch 13.5, cpvc pipes 3/4" sdr 13.5, cpvc pipe 1" sch 13.5, cpvc pipes 1.1/4" sch 13.5, cpvc pipes 1.1/2" sdr 13.5 and cpvc pipe 2 from Jamnagar. Our company carved out a distinct position in trading the best quality 0.5 Inch UPVC Pipes SCH 13.5. Our offered products are specifically designed in adherence to international quality standards using the finest quality raw material and advanced technology. The offered products are thoroughly examined by our quality controllers on different parameters to ensure its quality. Clients can avail these products from us at economic prices. 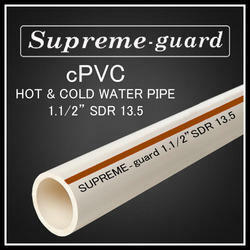 We have uniquely positioned in the market by offering best and excellent quality array of 0.75 Inch UPVC Pipes SCH 13.5. These pipes are created assistance of best tools. These pipes are used in garden areas for supplying water to the plants and trees. They are flexible, light weighted and quality assured. They are available in cost effective rates. We are offering a wide collection of 1 Inch UPVC Pipes SCH 13.5 which known for unique features. These products are designed by well trained professionals making use of the high quality material that is procured from the certified suppliers of the industry. We are providing these products to our esteemed clients in varied specifications. Our clients can avail these products at pocket friendly price from us. By keeping a close track on the fabrications, we are offering best and excellent quality array of 1.25 Inch UPVC Pipes SCH 13.5. These pipes are metal finished and created assistance of best tools. These pipes are elite and easy to install. They are flexible and best in quality finish. They are cost effective in rates. Our company carved out a distinct position in trading the best quality 1.5" Inch UPVC Pipes SCH 13.5. Our offered products are specifically designed in adherence to international quality standards using the finest quality raw material and advanced technology. The offered products are thoroughly examined by our quality controllers on different parameters to ensure its quality. Clients can avail these products from us at economic prices. We are offering a wide collection of 2" Inch UPVC Pipes SCH 13.5 which known for unique features. These products are designed by well trained professionals making use of the high quality material that is procured from the certified suppliers of the industry. We are providing these products to our esteemed clients in varied specifications. Our clients can avail these products at pocket friendly price from us.